The blank family trees pictured below will record three generations of direct ancestors. They are set against a backdrop of a tree in full summer bloom providing shade to some sheep and their young. When completed, the chart makes a unique keepsake of your family history. You can make your own family tree by adding your own name to the base line, below the trunk, and adding the names of your parents, your grandparents and your great grandparents above. Or you could create something really special for a friend or other family member, by placing their name in the base line and researching their line backwards in time to fill in all the boxes. Because the tree is so pretty, these blank family trees also look outstanding framed and hung on the wall for all to see. A great gift idea! You can download the blank family trees below, but you must first decide how you wish to complete the chart. OPTION 1: Print one of these blank family trees before filling in your ancestors' details by hand. .
OPTION 2: Fill in the form on screen and print it. With this option you download the blank family tree template to your computer and then fill it in on screen. You can save the tree at any stage of the process, whether you've only filled in one or two names or have completed the details for all three generations. When you're ready, you print it. The beauty of Option 2 is that this blank family tree template is coded to type the names in an elegant calligraphic font so the finished article is guaranteed to look neat and very stylish. 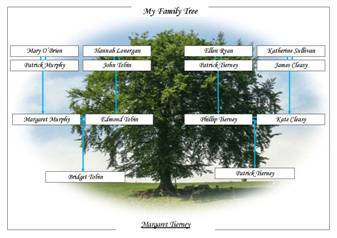 See Toolkit's full range of family tree templates. Do you need some free family history forms to keep your research organised? * See Toolkit's full range of family tree templates. * Do you need some free family history forms to keep your research organised? If you involve the whole family in your ancestral research, you'll probably discover a lot more than you would on your own. You'll certainly get along quicker if there are several other eyes and minds contributing to the research. Re-focus. Don't keep your eyes so set on finding the next bit of genealogy information that you forget to enjoy today's discoveries. Real people, real lives. Family history is about real people — your ancestors — who lived, worked and loved. Don't just uncover their dates of birth and death. Explore how they lived and what their main contemporary concerns might have been. Try to uncover some stories about them as individuals (perhaps interview someone who may have known them). This approach makes family research far more interesting and, for the kids, far more educational. Send a newsletter. If several members of the family are contributing to the research, it's a good idea to keep everyone up to date with all the team's discoveries. Send a regular email update or newsletter. This is a great way of building and maintaining family relationships, especially if there is a lot of distance between you all. If you follow these tips you'll not only be able to quickly fill in the blank family trees on this page, you'll also be able to relate interesting stories and anecdotes about your ancestors to those who admire your completed chart.